After spending time working on so many great interiors over the years, it was time to take that same dedicated focus and expand our offerings to provide the finest in exterior stone as well. After years of research and focus on the right types of stone and investment in top of the line equipment, La Pietra Thinstone Veneers was born and became the newest addition to the La Pietra family. While embarking on this new venture and development of this innovative product our mission was very clear, we wanted to provide our customers with the finest locally sourced New England stone that could be used in a variety of applications, offering custom blends and patterns to suit each individual project. 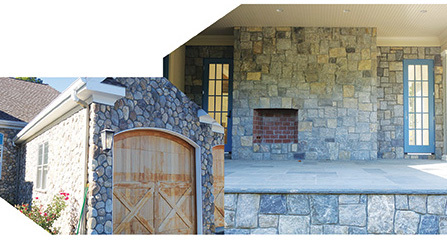 We wanted customers to realize the versatility of our 100% natural thinstone veneers, whether they were updating the exterior of a home, re-facing a fireplace, building a stone wall or designing an elegant wine cellar. La Pietra’s thinstone veneer is the premier product to use in a number of applications and provides our customers with a cost effective way to achieve an authentic “New England” look at a fraction of the price. With a growing number of prestigious dealers from all over the United States, we highly pride ourselves in maintaining only the best working relationships with a product to match. Thank you for visiting our site.